I woke up to glorious sunshine and hardly a cloud in the sky and it looked like summer had finally arrived, I actually got out the pond a little early and there were a couple of stand ins today, Dave Lawrence was fishing for Rocking and Chris Haines must have been struggling to find a replacement because the Torquay Tart was fishing for him! 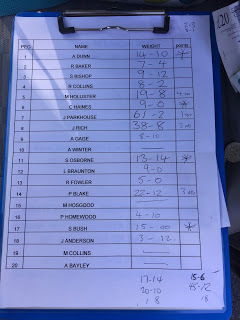 Chilly was also absent today but didn’t have a stand in and when the envelope was drawn for todays peg sequence he would have been in peg 10 which is one of the best pegs on the pond. When Les read out who was where, my home for the next six hours was peg 8 which I was happy with as that end of the pond has been pretty consistent. I had my usual side bets with Janders, Picky, Jamie P and Paul H plus the Tart. 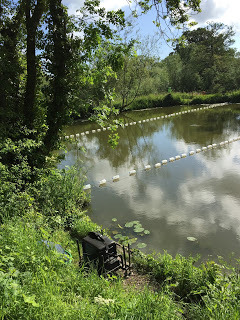 As I took my kit to the peg, there were carp cruising about everywhere and once again I thought we might be in for a good day although the early pegs had a nice ripple whereas our pegs at the top end were flat calm which I didn’t think would help with my shallow fishing. 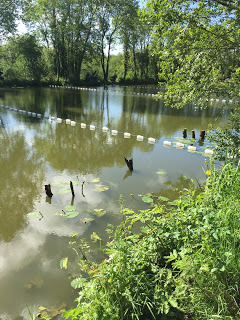 I set up an inline dibber for fishing shallow, a 0.4 gram Drennan Carp float for fishing the meat at five metres (not used again!) and a little Trabucco dibber for fishing meat in the margins. There were quite a few lilies on the inside and to the right there were several tree stumps sticking out of the water which I knew any hooked carp would make a beeline for. To the left there was a cormorant roost (fish refuge) and I thought this would be a better option for my main margin line. For bait I had 6mm and 8mm pellets plus some 6mm luncheon meat to which I added a couple of squirts of Bait Tech’s Krill and Tuna liquid. We had our rod licences checked by an EA bailiff before the start and that’s the second time this year (on two different venues by two different bailiffs) I’ve had mine checked. So after a quick coffee and a chat with Jamie P, Picky and the Tart it was time to start. I fed some meat by hand in the left hand margin and at 5 metres and before I’d had time to ship out, the Tart was into a fish first chuck. I was feeding 6mm pellets at 11.5 metres and lifting and dropping the rig and after ten minutes, had my first fish, a carp around 3lb. It wasn’t fast and furious but I added number two before the first hour was up and normally two fish an hour and you won’t be far off here. Jamie P next door had caught a couple and Oz in 11, Dave Lawrence in 13 and Blaker in 14 had all got off the mark too but nobody was bagging. Going into the second hour I was still fishing shallow but couldn’t buy a bite despite loads of fish swimming about in little groups and they just didn’t want to know so maybe they still had spawning on their minds. I didn’t want to try my inside line too early but when Jamie P had a couple of carp in quick succession, I had to give it a go. I missed a good bite before hooking a fish only for the hook to pull out nearly straight away. Another missed bite followed before I hooked another that gave me the run around and snagged me under the cormorant roost a couple of times before I eventually netted it. My rig was in a bit of a mess though and all my float rubbers had come off! I spent five minutes sorting it out but all that commotion had killed that line. So with over two hours gone, I was on three fish but it was a struggle, I did have a go on the inside to the right but missed a couple of bites which I think were small fish so it was back out on the shallow rig. Nobody was catching apart from Jamie P who had mugged a couple so I shallowed up my rig a bit and started flicking the rig in front of cruising groups of fish, much to Les’s disgust. Over the next couple of hours I had five more carp but Jamie P always stayed a few fish ahead. Picky made me chuckle when he accused me of playing ‘Cops and Robbers’ with the carp as I chased them around with my shallow/mugging/stalking rig. With an hour to go, I was back on the inside and had my biggest fish, a common carp of 6lb or so to put me on nine fish, Jamie P was now on fourteen or fifteen carp and looking good for his second win of the series. Les in peg 12 managed to foulhook a decent eel! and then found a couple of carp towards the end of the match. I lost a fish on the shallow rig which I suspect was foulhooked and that was the end of the action. I packed up and as I walked back towards the car park, I asked how people had got on, Brandon only added one more to his early carp, the Hoff had five in peg 5, Mike’s boy had a couple in peg 4, Bish had two as well, Butch had struggled and Dunner had four in peg 1. That end hasn’t been great and I’ve still got three pegs to come in that area. After loading the cars, we gathered at peg 1 for the weigh in, Dunner had 14lb 10oz and that was the top weight until we got to the Hoff who had 19lb 8oz, the Tart weighed 9lb so my tube of Savlon remained unopened for another week and I was briefly another pound better off until we got to Jamie P who had 61lb 2oz and would win comfortably with that. My nine carp weighed 38lb 8oz to put me into second place. Picky had 8lb 10oz so I was a pound up on the day again, Oz had 13lb 14oz in peg 11 before Les had a level 9lb, Dave weighed 5lb, Blaker had 22lb 12oz to go into third place, Exeter Mike didn’t weigh, Paul H had 4lb 10oz, Bushy had 15lb and Janders had 3lb 12oz. Mike and Andy in the last two pegs (19 and 20) didn’t bother weighing. At the results, Jamie P won, I finished second and picked up £80 (and finished 4-1 up on the side bets), Blaker was third and the Hoff was fourth. Special mention must go to the Tart who picked up the section money by double default in our four man section! Ilminster AA’s Dillington pond fished really well again today with loads of double figure weights and lots of bream, skimmers and quality roach featuring in catches. 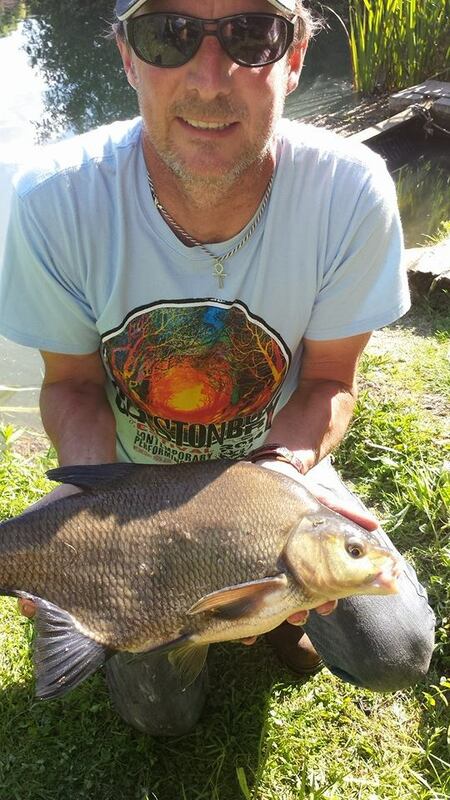 Steve Hurford topped todays field with 31lb 5oz of bream and skimmers from peg 1, Frank Woodard was second with 24lb 12oz of bream and skimmers on the feeder from peg 11 and Scott Russell was third with 18lb 5oz of quality roach caught shallow. Next: Next post: So you want to be sponsored?